MS Dhoni’s impeccable decision-making skills and remarkable instinct has been praised by most cricket lovers and pundits. On many occasions, his decisions have proven to be the turning point of the matches. Like the last time when Dhoni suggested a change in the field to Rohit Sharma during India’s game with Bangladesh in the ongoing Asia Cup 2018, it resulted into the wicket of Shakib Al Hasan. 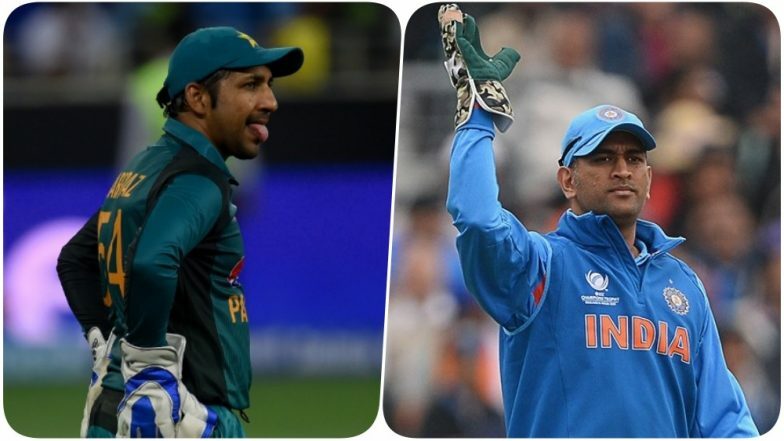 Now, Pakistani captain Sarfaraz Ahmed tried emulating Dhoni yesterday, while playing against Bangladesh by suggesting a change in the field. BAN Outplay PAK to Set Up Finals Clash With India. Here’s the video of the former skipper of India suggesting a change. Talking about the match yesterday, Bangladesh defeated Pakistan by 37 runs and have been knocked out of the Asia Cup 2018. In the post-match conference, Sarfaraz Ahmed admitted that his captaincy had been poor and there were many setbacks the team faced during the tournament. “We are obviously not feeling good. As a team, we have not done well. Our performance has been very poor. As a player, I have done really badly too. I should have done better. We were poor in every facet of the game. There were a lot of batting collapses for us in the tournament," said Sarfaraz Ahmed.